Nutritionists say that anyone at risk of developing age-related macular degeneration (AMD) should start adding kale to their daily diet. Eating a good supply of this green leafy veggie every week can dramatically cut a person's risk of developing the blinding eye disease. The main reason kale is so helpful when it comes to preventing AMD has to do with an antioxidant called lutein. Just one bowl of kale has a great supply of lutein, which is essential for eye health. If you don't like kale for whatever reason, you're in luck. There are many other common veggies that have high amounts of lutein. A few of these foods include carrots, spinach, and avocados. A 2015 study investigating the benefits of lutein found that just taking a lutein supplement every day could help people at risk of developing AMD. Researchers gave patients between 10mg and 20mg of lutein over the course of a few months and monitored their eye health. After 48 weeks, scientists found that their patients had a dramatic improvement in retinal health. A few scientists say that lutein works even better in combination with another antioxidant called zeaxanthin. 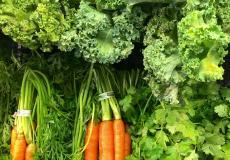 Green veggies like kale, spinach, and broccoli are also high in zeaxanthin. Yet another scientific study found that people who took 10mg of lutein and 2mg of zeaxanthin over a period of five years had a 10 to 25 percent reduced risk of developing AMD. People over the age of 65 who don't get enough lutein or zeaxanthin in their daily diet should consider taking daily supplements. There are two main forms of AMD: dry AMD and wet AMD. The more common form of this disease is dry AMD, which causes the retina to degenerate over time. Although wet AMD is less common, it is more severe since it's caused by a leaking blood vessel behind the retina. Most of the time AMD doesn't present visual symptoms until the disease has already progressed a great deal. This is why health professionals recommend people over the age of 40 to get at least one vision screening with a certified optometrist every year. There is no cure for AMD at this moment. Doctors can, however, prevent serious symptoms from this disease if they catch it early enough. A few mild treatment strategies include supplementing with zinc and vitamins A, C, and E. Dry AMD patients might see improvement with laser eye surgery or corrective lenses. Most wet AMD patients need to get injections into their eyes on a monthly basis. Doctors may also prescribe blood vessel growth inhibitors to wet AMD patients. Besides helping with AMD, kale has numerous other health benefits and is classified as a "superfood" by many nutritionists. A few of kale's other incredible benefits include help with the body's natural detoxification procedures and cancer prevention. Anyone who doesn't like eating kale by itself can sauté the veggie with olive oil, garlic, raisins, and red wine vinegar. You can also blend kale into smoothies or bake them in the oven with sea salt to make delicious kale chips. AMD is the most common cause of blindness in people over the age of 65.